Pilates, Sports therapy and Performance sessions are available throughout the day. Some days commencing at an early 7 am, continuing through to the late evening. I have been blighted with knee pain for a long time, until now. 37 years of knee pain and 10 operations - a menisectomy in the right knee, four operations for congenitally displaced hips and then both hip joints replaced – the knee pain returned 3 years after the right hip replacement and steadily increased over the following five years. I have always swum for enjoyment and to help my mobility, fitness and strength. I have also practised Pilates for some 15 years, which is very beneficial for my mobility, strength and fitness. The knee pain was flummoxing - physiotherapy not making a difference, and after two more investigative arthroscopies of the right knee in 2011 and 2012, the consultant concluded the knee to be of excellent condition: But, debilitating pain persisted and the consultant set the date 12/12/12 for a knee replacement. In November 2012, a breakthrough occurred. Johnny Kennett wondered whether the consultant had considered nerve damage arising from earlier surgery. Johnny produced his hypothesis, along with diagrams and notes, this question was taken up with the hospital. The consultant admitted that my problematic knee baffled him and I was referred to the Head of Orthopaedics. Knee operation cancelled. 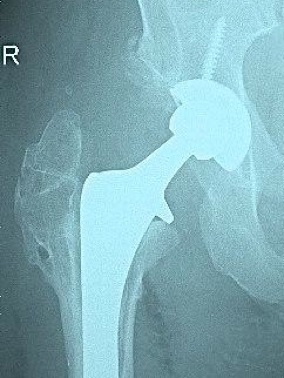 A CT scan indicated that part of the 2002 implant was loose and needed replacing. Johnny was right! Before this operation took place, both Johnny and I ensured that as much exercise as possible was undertaken:- my Pilates sessions were doubled to twice per week whilst in the pool, I swam a mile almost every day. This benefited post-op strength and made my recovery quicker and more effective. The operation went well and after doctor’s permission I re-commence my deep tissue massages with Johnny and re-started his all-important Pilates sessions. 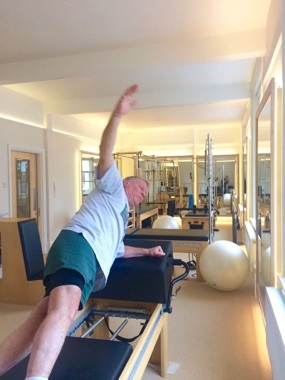 At no time did I have physio sessions at the hospital but relied almost entirely on home physio exercises together with the Pilates studio-based exercises to restore my right leg to normal working. Johnny helped enormously both with the postoperative remedial massage, body and leg strengthening. I feel sure that these measures all helped to bring about my life-changing recovery. To be able to walk without pain and stiffness for almost the first time in 37 years is amazing! Of course it has been pointed out, without me actually doing all the work, the resultant turnout would not be anywhere as good as what it has been………a wonderful result!